Ever since her sixteenth birthday, strange things keep happening to Seraphina Parrish. The Lady in Black… burns Sera’s memories. Unexplainable Premonitions… catapult her to other cities. The Grungy Gang… wants to kill her.And a beautiful, mysterious boy… stalks her. Time travel is usually a theme that makes me nervous. I love the science fiction, but I’m always afraid of the choices characters will make because they can change the course of time and completely change the fate of the world. Wander Dust didn’t give me that feeling of impending doom. Michelle Warren adds flare and mystery to time travel and creates a world discreetly separated by Normals on one side and Wanderers, Seers, and Protectors on the other. I pegged Seraphina as a rebel from the very beginning. She loved to spite her father just to get a rise out of him. For someone who didn’t have a great relationship with her father, and never knew the guidance of a mother, Sera turned out to be a pretty well-behaved kid. She wasn’t above breaking the rules, but she wasn’t a wild child either. When Sera moved to Chicago to live with her aunt Mona, a different side of her showed. She’s the kind of character you either love or hate. I love Sera because she thought about the situations she got herself into. She didn’t always make the best choices, but she did what was best based on what little she knew of the Wanderer Society. There’s much learned, and much still to learn, about the Wanderer Society. Readers are really only given a snippet of how students at the Academy, a boarding school for students of the Society, use their powers in the real world. The novel’s pacing is fast, but sometimes it slowed down when Sera needed something explained to her. The characters in lecture mode were not appealing at times, seeming like they were just speaking at Sera to show they knew their information. 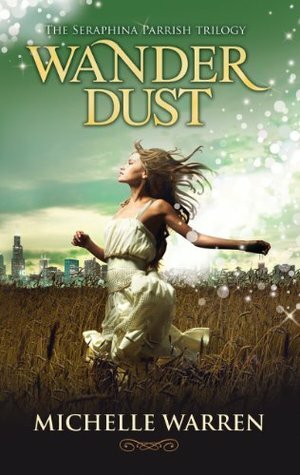 Wander Dust is a wonderful start for The Seraphina Parrish Trilogy. There are a few unresolved issues in the plot that causes my curiosity to read what happens in the next installment. I have hopes that Book 2 of The Seraphina Parrish Trilogy will still be filled with the humorously outrageous characters and events of Wander Dust.